By Paul Chefurka: No really, how sustainable are we? I was starting to write an essay on overpopulation exploring the solution space where a breakthrough in denial enabled a planned global birthrate reduction. My goal being to present a reasonable scenario for making the future less bad. Then I read this paper by Paul Chefurka who is one of the wisest people on the planet and I decided to trash my paper and point to his. Paul takes a close look at the maximum size of a truly sustainable human population. His conclusion is 10 million. The analysis seems sound to me. The obvious conclusion is that we can’t get there from here with any form of awakening or proactive action. …the analysis suggests that Homo sapiens is an inherently unsustainable species. This outcome seems virtually guaranteed by our neocortex, by the very intelligence that has enabled our rise to unprecedented dominance over our planet’s biosphere. Is intelligence an evolutionary blind alley? I wish Paul would read Varki’s book on denial. 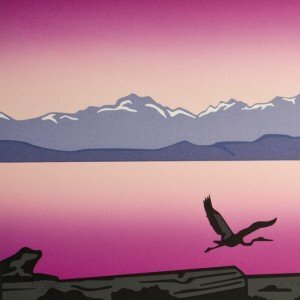 I suspect Paul would appreciate it because Varki presents a theory that confirms Paul’s speculation about the inherent unsustainability of humans. In summary, the evolution of the powerful human brain required a mutation for denial of reality, and this denial prevents us from acknowledging our predicament. 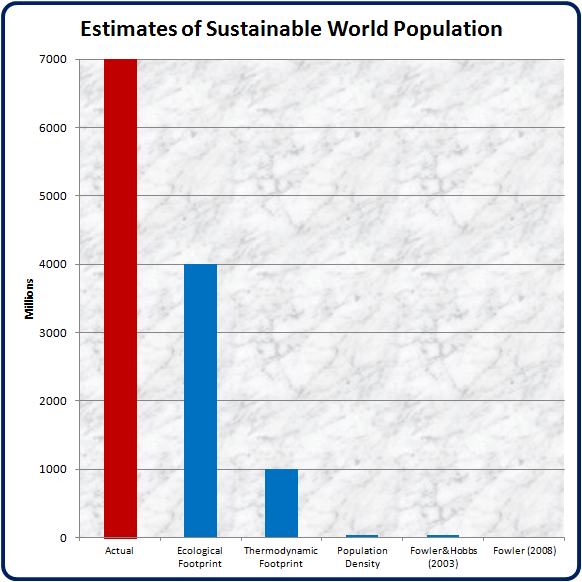 As you can see, the estimates for a sustainable human population vary widely – by a factor of 500 from the highest to the lowest. The Ecological Footprint doesn’t really seem intended as a measure of sustainability. Its main value is to give people with no exposure to ecology some sense that we are indeed over-exploiting our planet. (It also has the psychological advantage of feeling achievable with just a little work.) As a measure of sustainability, it is not helpful. As I said above, the number suggested by the Thermodynamic Footprint or Fossil Fuel analysis isn’t very helpful either – even a population of one billion people without fossil fuels had already gone into overshoot. That leaves us with four estimates: two at 35 million, one of 10 million, and one of 7 million. The central number of 35 million people is confirmed by two analyses using different data and assumptions. My conclusion is that this is probably the absolutely largest human population that could be considered sustainable. The realistic but similarly unachievable number is probably more in line with the bottom two estimates, somewhere below 10 million. I think the lowest two estimates (Fowler 2008, and Fowler 2009) are as unrealistically high as all the others in this case, primarily because human intelligence and problem-solving ability makes our destructive impact on biodiversity a foregone conclusion. After all, we drove other species to extinction 40,000 years ago, when our total population was estimated to be under 1 million. So, what can we do with this information? It’s obvious that we will not (and probably cannot) voluntarily reduce our population by 99.5% to 99.9%. Even an involuntary reduction of this magnitude would involve enormous suffering and a very uncertain outcome. It’s close enough to zero that if Mother Nature blinked, we’d be gone. In fact, the analysis suggests that Homo sapiens is an inherently unsustainable species. This outcome seems virtually guaranteed by our neocortex, by the very intelligence that has enabled our rise to unprecedented dominance over our planet’s biosphere. Is intelligence an evolutionary blind alley? From the singular perspective of our own species, it quite probably is. If we are to find some greater meaning or deeper future for intelligence in the universe, we may be forced to look beyond ourselves and adopt a cosmic, rather than a human, perspective.